So, with many helpful pointers from YouTube videos and Reddit, I did it! It worked on first try. If you look into the barrel of the pen, there are two sides — there’s the side where the Noodler’s nib fits, then there’s the side that has a little extra plastic. Each side is approximately half the barrel. 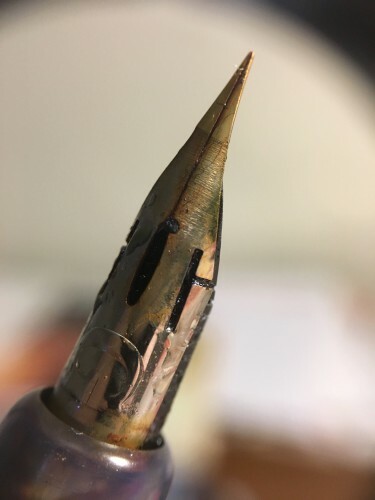 I found that I initially positioned the nib and feed such that the Zebra G was where the Noodler’s nib was, the pen would write great, but the nib touched the cap, leaving me with little puddles of ink in the cap. I then repositioned it so the nib was on the side with the little plastic rim, and the nib no longer touches. However, it was impossible for me to get it in on this side before the initial heatset — so this may have to be a two-step process. It writes! Taken right after the initial heat set, it wrote easily right away. Ignore the crazy person writing in the background — I was so surprised I got it working on first try. 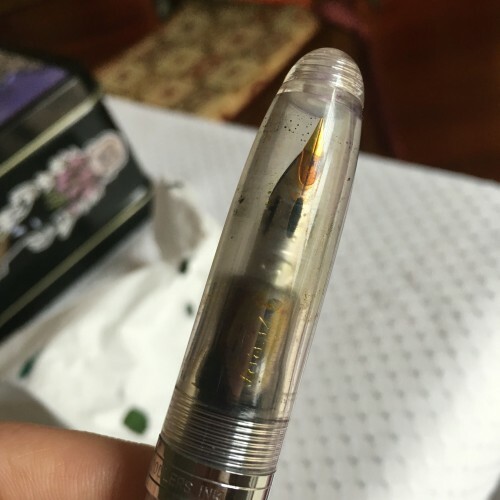 Two days later, you can see the nib touches the cap — leaving a constant blob of ink. 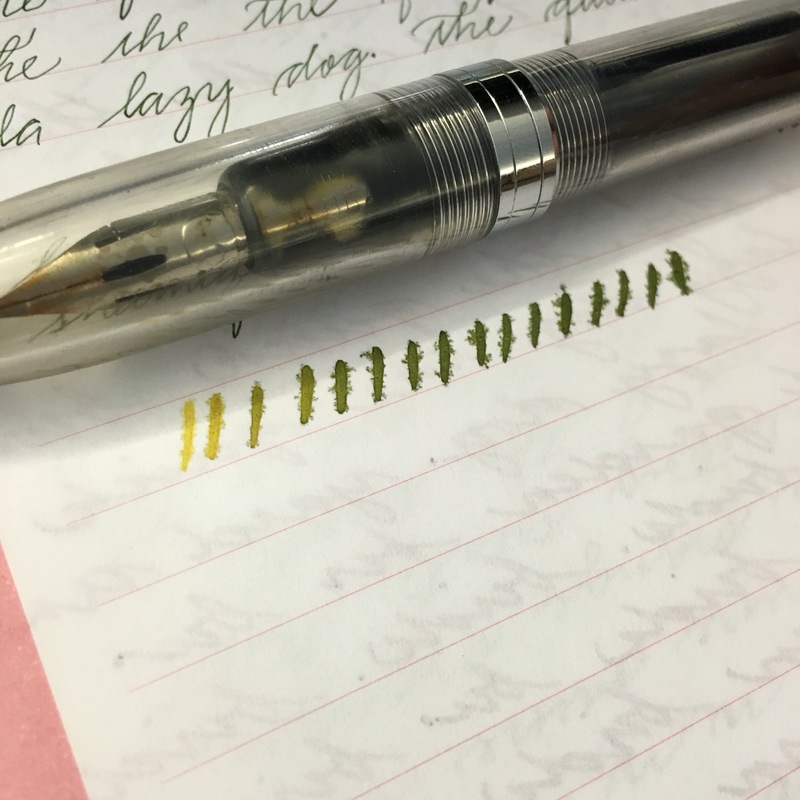 The pen is filled with Diamine Evergreen, but the nib’s corrosion is clearly discoloring the ink. Four days later — I can no longer wipe off the rust, you can see it’s starting to set in along the slit. Pen still writes great though. After taking this photo, I re-heatset the nib after rotating it (and the feed) 180 degrees, and now the nib no longer touches the cap! Taken this morning (five days since) — it takes a couple strokes after the pen has been sitting for several hours to get to normal ink. 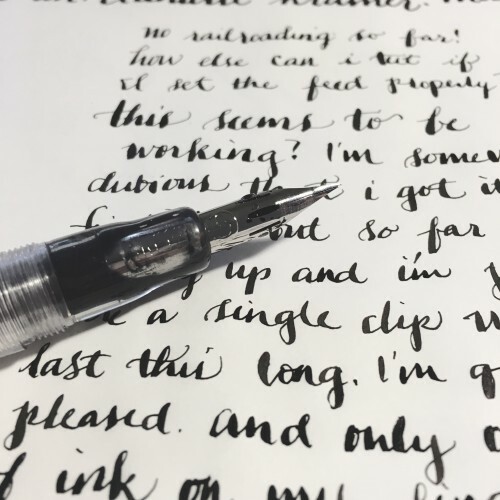 At this point I’ve probably written 7-10 full pages of Spencerian practice with the nib. So far I’ve been tucking it into my (makeshift) pen case and carrying it around in my backpack with my other regular-use pens (currently two Esterbrooks) and it’s been leak and problem free. 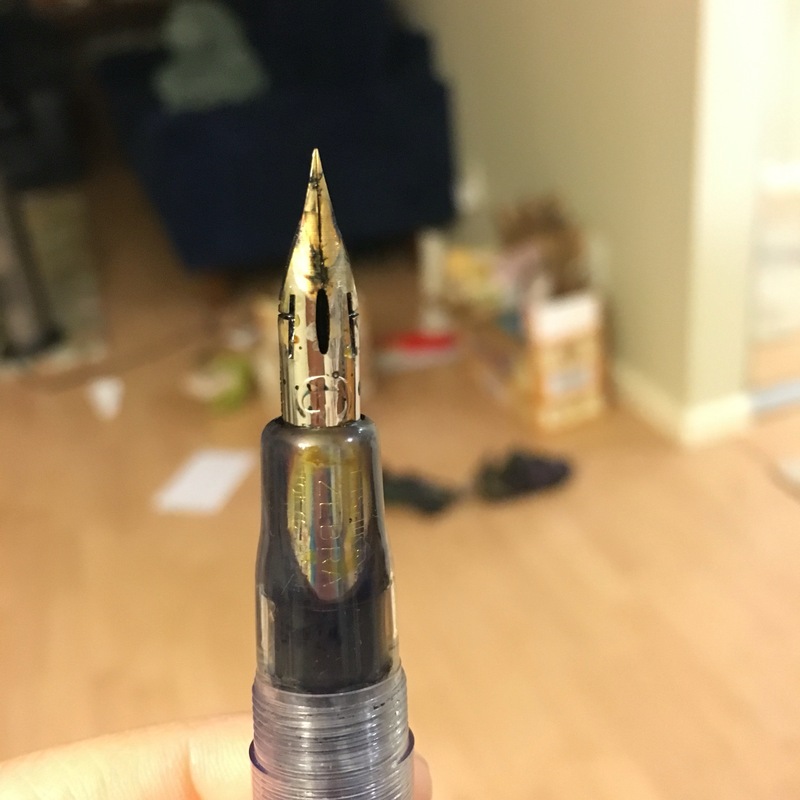 I replaced the nib last night. I wrote with it for a bit, then began to notice that it wasn’t producing a fine hairline anymore. So I got about a week and a half out of it. Here’s the nib before I pulled it out — both the top and bottom are rusted. There was also some ink+rust gunk in the feed. 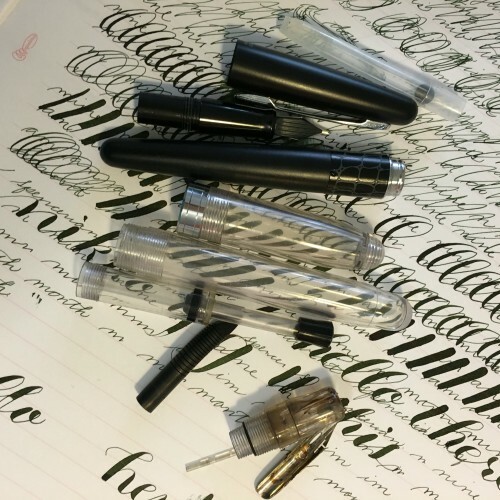 The part of the barrel that touches the nib also seems permanently rust-stained — last night was pen cleaning night, so here are the parts of my Ahab and a Metro. I popped in a new nib this morning (and J Herbin Violet Pensee) and it wrote right away. 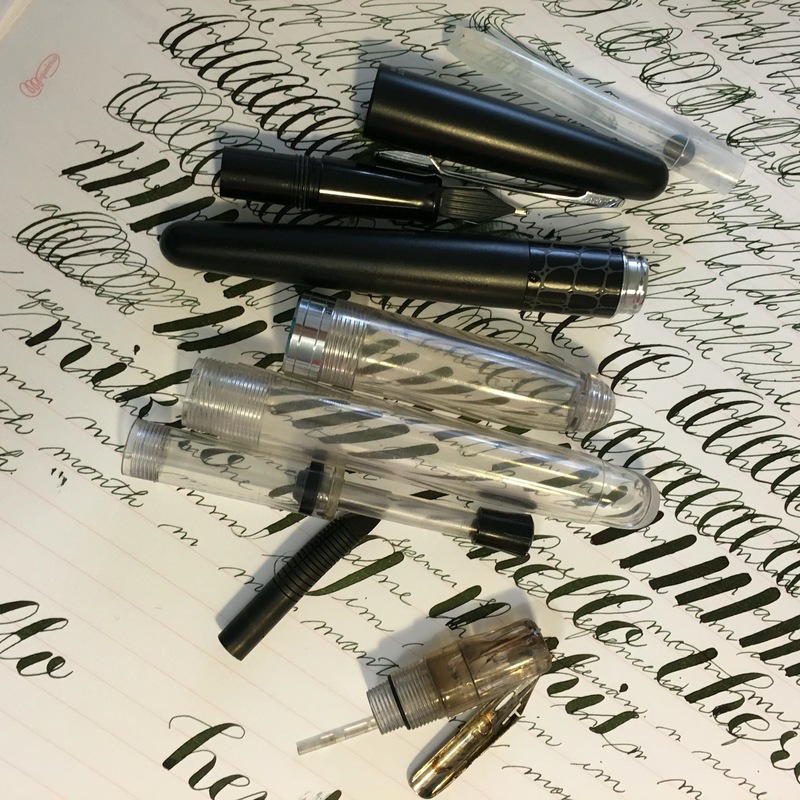 Seems to be a little more prone to leaking — I’m not yet sure if that’s the ink or the way I positioned the nib. This entry was posted in fountain pens and tagged ahab, flex, pens on December 29, 2015 by me.